Bigger than life…biogeographer, story teller, inspiration for sustainable design practice. From the backyard to the “Global” gardener. Bill wasn’t perfect (who is? ), but we loved him, and the worms will too. Summer Fruit Season is Here! Well it has been quite a while since my last blog post here, but I hope you have been following my twitter feed (last few tweets over there in the right column). 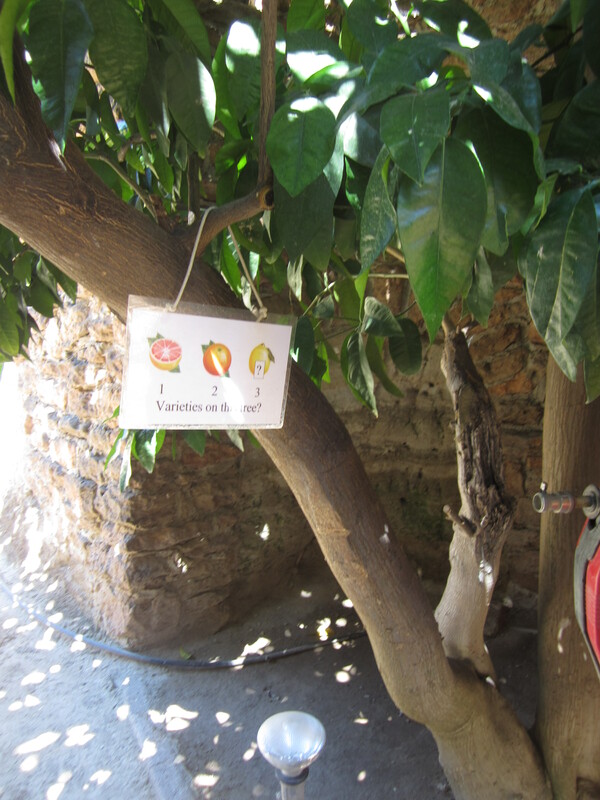 Continued dry and warm winter weather had it’s effect on the health of fruit trees. Two very dry winters meant that there was no residual ground waterr stored in the soil. Being used to typical wet winters, many back yard growers did not irrigate enough and the trees are suffering. Please water your trees! Especially young trees need good watering. We are suffering in this drought, so do recycle graywater, and build yourself some rainwater catchment. Adding to our problems was the approximate 50% of normal “chill” hours or units, affecting certain northern species like cherries, apples, aronia, haskap/honey berry, among others. Chill hours are calculated in several ways, but it is generally: total accumulated hours of temperatures between 45F and 32F, between November and February. Typical symptoms were obvious with my ‘Honeycrisp’ apple this spring: delayed and ongoing flowering (currently holding normal size half grown fruit, smaller marble size fruit, and flower buds just opening), delayed leafing out, with many branch tips bare, and new growth from lower branches. This is a great time to see which trees are actually low chill, and to consider increasing plantings of them. The few rains we did have were timed perfectly to promote heavy fireblight damage. This bacteria thrives in warm wet weather in the spring, especially during flowering, with bees actually spreading the pathogen from tree to tree. I have had major losses of large, otherwise health pear trees, including ‘Bosc’, ‘Williams’/’Bartlett’, and asian pears. Fortunately my favorite pear, ‘Seckle’ is fairly resistant, and has been used in breeding of other resistant varieties, like ‘Magness’ (‘Comice’ X ‘Seckle’). Without many options to prevent, or cure, the only thing I can reccomended is to prune out damaged branches back to healthy wood/cambium, and planting resistance varieties. I am getting used to maggots in my ripe berries, but was sad to find them I am early whit nectarine this year. Cherry Fruit Fly, or Spotted Wing Drosophila (SWD) attracts whole fruit not just rotten fruit, like most fruit flies. I will put out apple cider bottle traps for SWD and for the Olive fly. With many wild untreated olive trees in our area, this fly causes about 90% crop damage most years. Trapping can reduce damage significantly, but commercial growers use a baited Spinosad product called “GF-120”. It is approved for use by organic growers, but is not so available to home gardeners. Instead I have been spraying a kaolin clay “protectorant” product called “Surround WP” (wettable powder). This can make egg laying difficult for olive flies, and coddling moth on apples. All my olive and apple trees are very white this time of the year! I will re-apply every 6 weeks until harvest, and will need thorough washing after. To much of a good thing: Thin, thin, thin that fruit! The dry spring weather made for an immense fruit set on many stone fruit and apple varieties. If you are greedy, and try to let all those fruit to mature you could have some serious problems: Breaking branches, (can be moderated by use of props, bands and straps), severe “alternate bearing” causing the tree to overbear one year and resting by producing no fruit the next, disease and pests are made worse with crowded fruit branches, quality of fruit is also compromised when crowded, with less sugar, less color and smaller. Please do not hesitate to take off all the excess fruit. 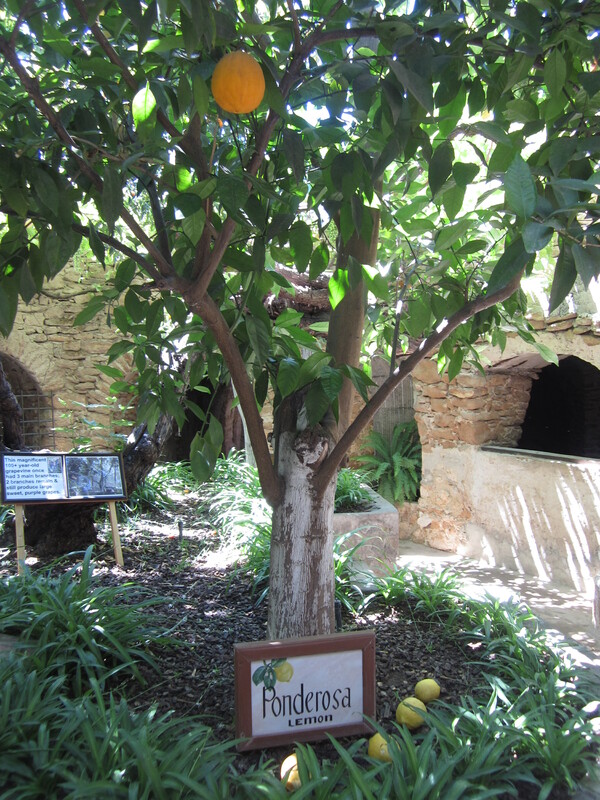 Imagine a full size fruit on the branch, and allow room so the fruit won’t touch– about 4 to 8 inches apart. This season’s branch growth is becoming more woody now (hardening off) and now is a great time to do some summer pruning to control growth from the buds we left behind from our winter pruning. The bottom of this seasons growth is perfect for various summer budding and grafting techniques. We graft year ’round! Andy’s Orchard had the first fruit tasting of the 2015 season. Held on Father’s Day, I attended with my son Ijah. Andy announced to a crowd of a couple hundred attendees that “this is our worst fruit harvest year ever”, with cherries having a 95% crop loss, mostly due to lack of chill hours. 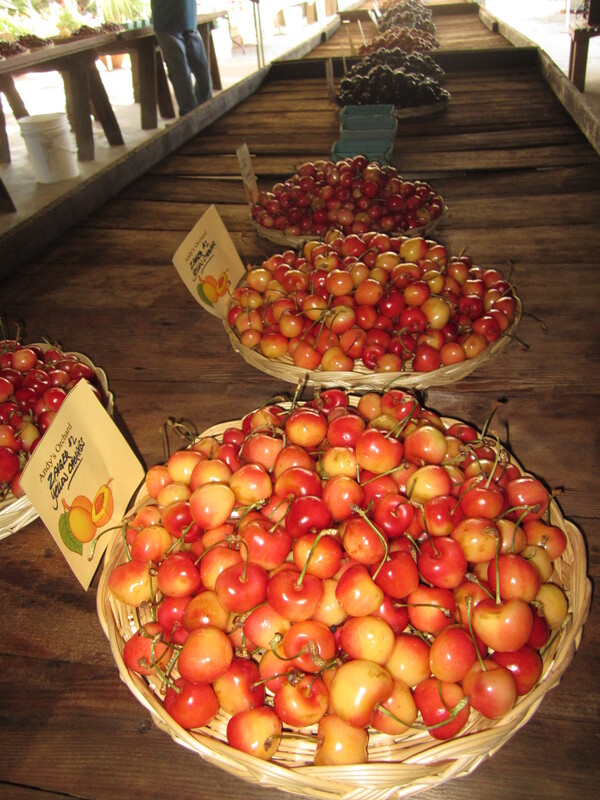 Though we did not taste as many as the 55 varieties as I had in the past, there were still many dozens of varieties of stone fruit to enjoy–including a dozen kinds of cherries and many apricots, plums, inter specific hybrids, peaches and nectarines. 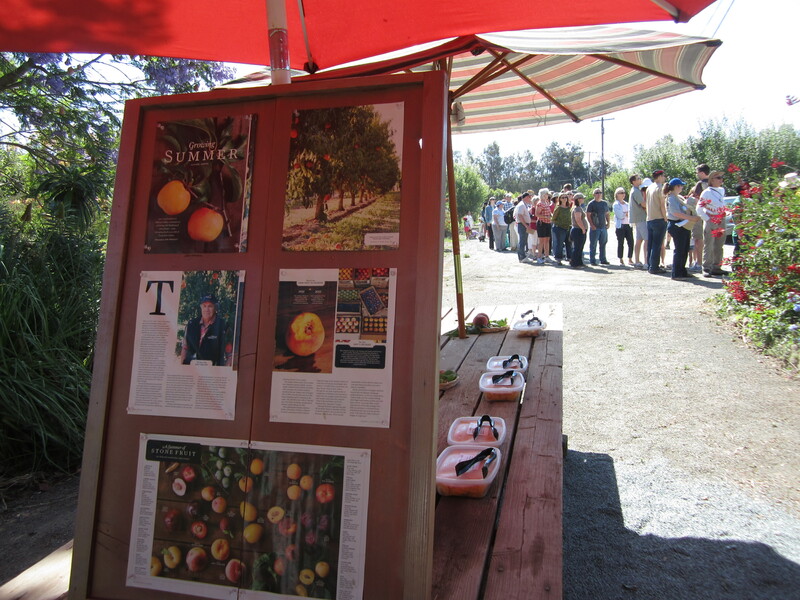 Find the schedule for the rest of the summer tastings at Andy’s Orchard website. 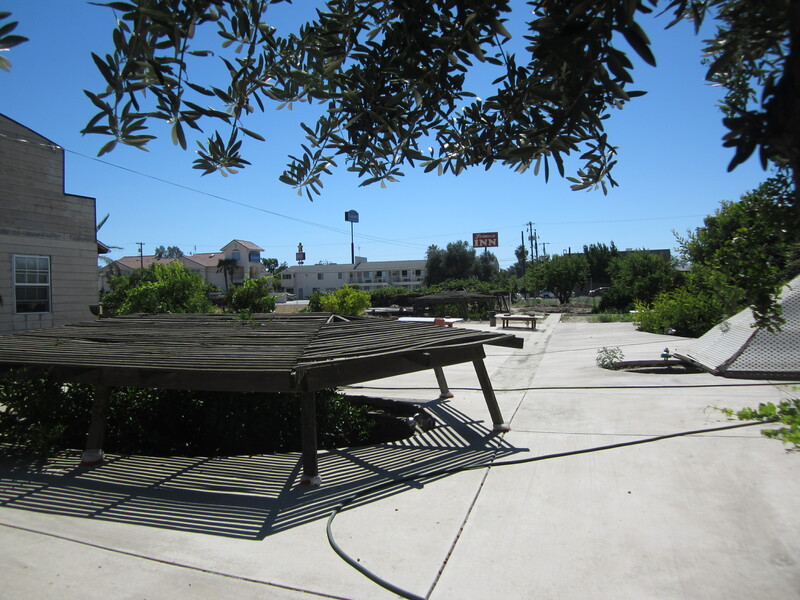 It should be a hot one, so come early to work in the garden, so we can be poolside when it heats up later in the day. We will work in the veggie gardens to clear, weed, plant, transplant, propagate, harvest and learn together. Get refreshed in the large swimming pool and share some food amid the palm trees & roses. Bring your swimsuit and a dish/drink to share… Musical instruments & Merriment welcome! The 5 acre property includes native oak forest and chaparral, 100-year old buildings, fruit trees and vegetable gardens, bamboo grove, fragrant rose collection and nursery. 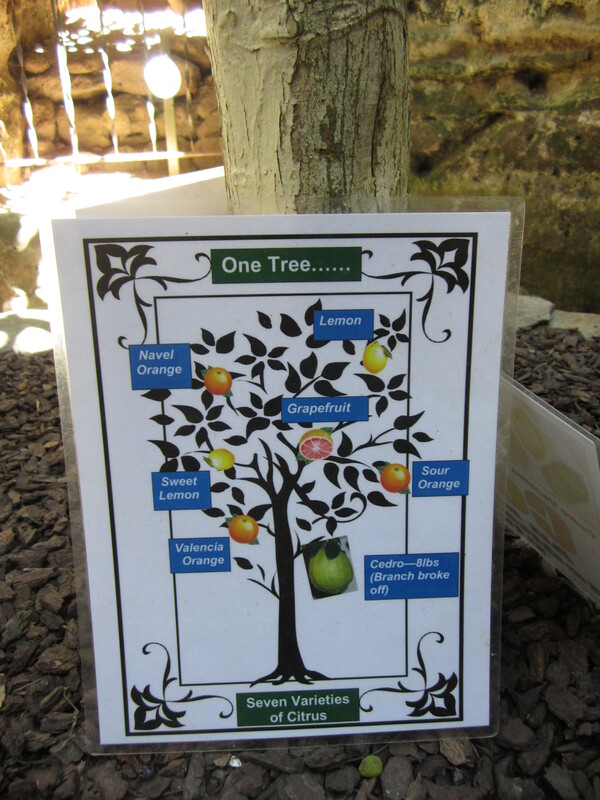 With established fruit trees that have been multigrafted, there are now about 150 varieties of fruit growing. Fruit tastings: Raspberries, Plums, Citrus. For those of you who cant make it in the morning but would like to play in the garden. Work and cool off in the pool anytime. Our first event was great, and we were greatful for the pool when it got to 100 F that day! Interested in collective gardening and orcharding? Join us this Sunday, the first in a Summer series ! Come join us for a day of education and work in the gardens and orchard followed by fun at the pool and a potluck. This is the first event in our summer series. We will start with a tour of the 5 acre property, which is a ‘gem’ that includes native oak forest and chaparral, 100-year old buildings, fruit trees and vegetable gardens, bamboo grove, fragrant rose collection and nursery. 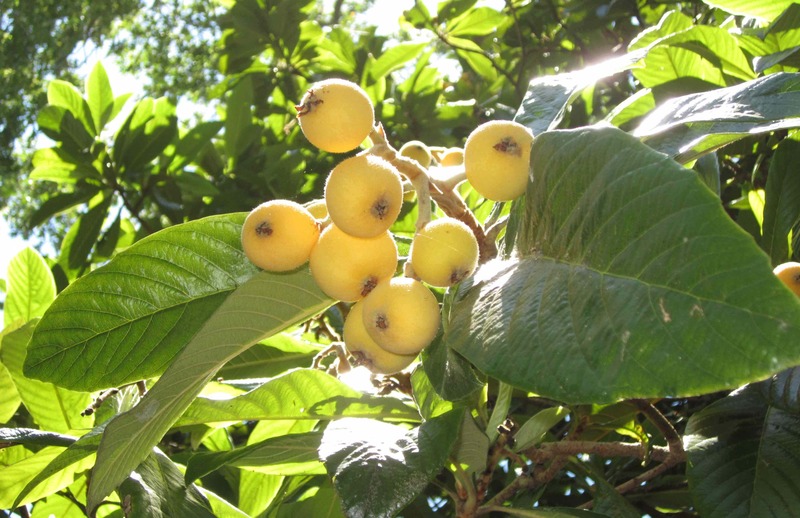 With established fruit trees that have been multigrafted, there are now about 150 varieties of fruit growing (there may be some berries to sample). We can then get refreshed in the large swimming pool and share some food amid the palm trees & roses. Bring your swimsuit and a dish/drink to share. 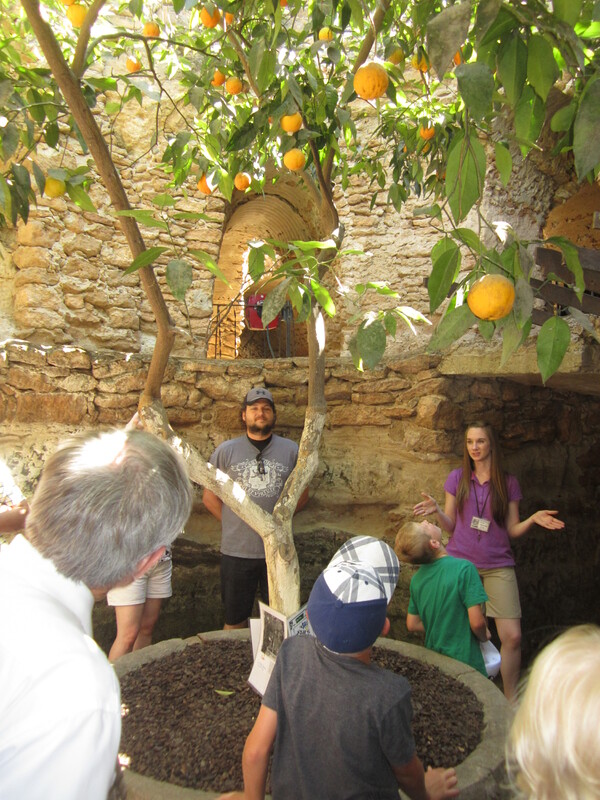 The tour and garden activities will be lead by John Valenzuela, gardener, consultant and Permaculture educator, who is also known as an expert ‘fruit freak’, serving as chairperson for the Golden Gate chapter of the California Rare Fruit Growers. 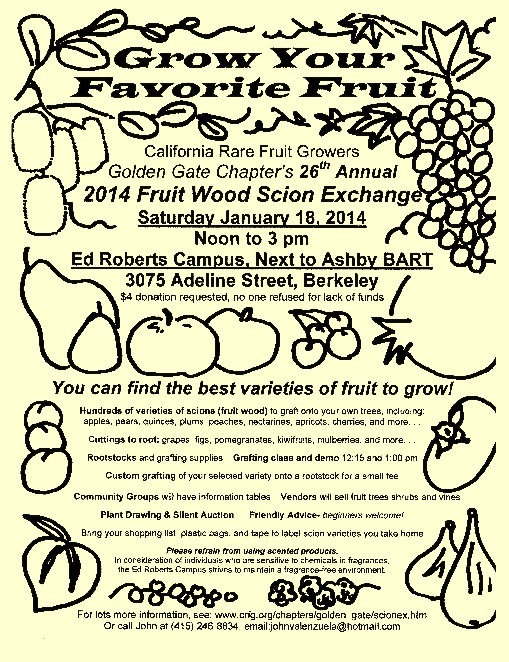 Get ready for the Golden Gate CRFG Fruit Wood Scion Exchange this Saturday by attending this talk tonight! 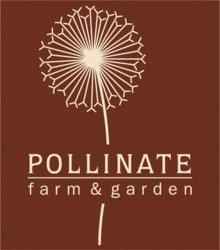 Later in the season I will also lead a grafting class at Pollinate, so stay tuned! While it may be so dry we are needing to irrigate, there are some things that assure us that it is indeed winter. 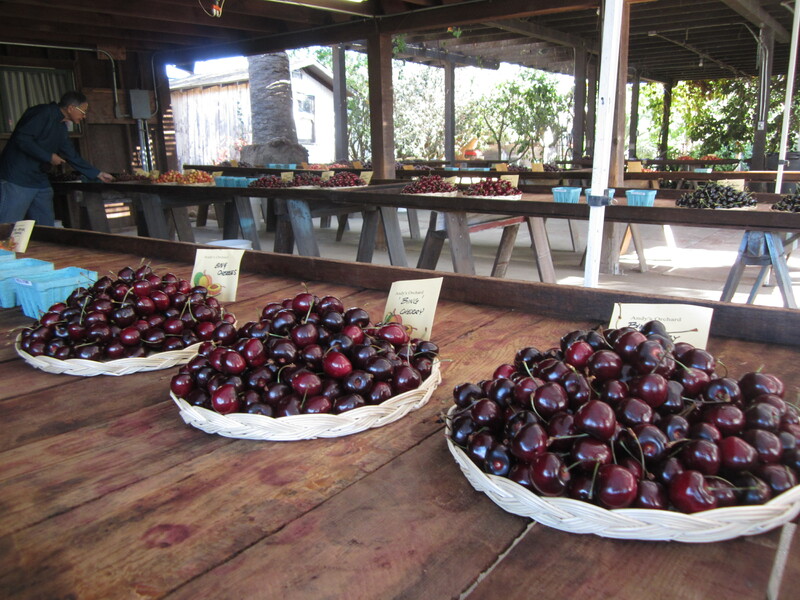 The scions have been cut from the California Rare Fruit Growers scion orchards of favored heritage varieties carefully maintained to preserve hundreds of unique varieties. This diversity of fruit varieties come from many regions from around the world, North America, in addition to local varieties from California, and even right here in the S.F. Bay Area. Even some modern varieties found in supermarkets might also be considered ‘rare’ fruits. 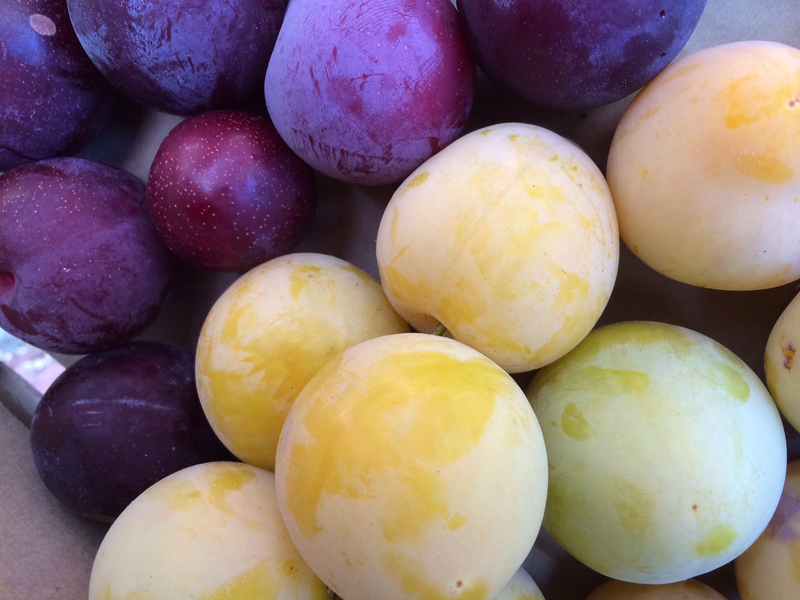 Unless you have picked tree ripened plum or peach from your own backyard tree grown in healthy soil, you may never have really tasted these ‘common’ varieties at their prime of maturity and ripeness. Scions are the tips of fruit tree branches used for making new trees, just the same as the original. This vegetative or asexual fruit tree propagation is done by rooting these cuttings, or if that is too difficult, by grafting – joining the scion to a rootstock of a compatible tree. Seedlings may be good for genetic diversity and discovering new varieties, but some species only make one out of a thousand trees worth eating fruit from. If you want a fruit tree that is exactly what you know you like, and that will come into bearing sooner than a seedling, vegetative propagation is the way to go. Come to our big Fruit Wood Scion Exchange this Saturday to learn more, and gain access to hundreds of varieties that are grown by the California Rare Fruit Growers in the Bay Area. The Santa Clara Valley Chapter and Monterey Chapters have already held their exchanges this year, and the Golden Gate chapter is next! 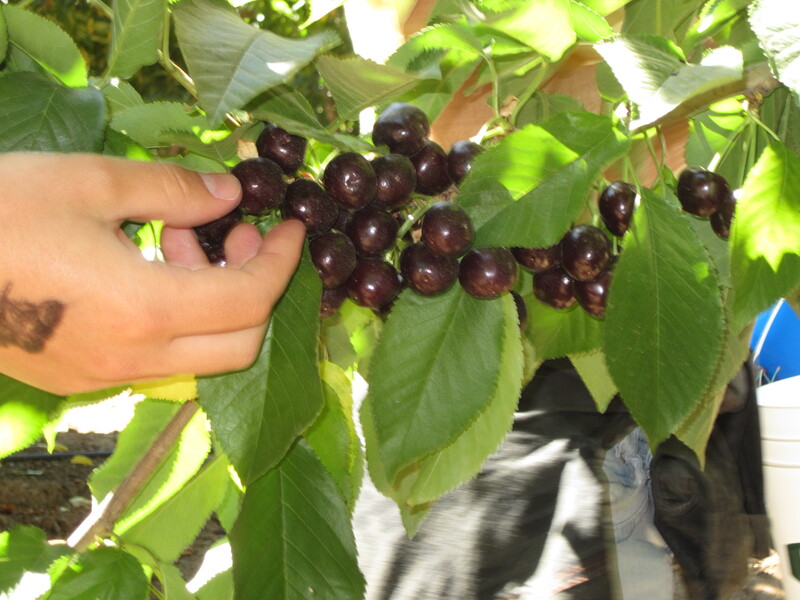 Protect the rights of fruit tree breeders! A reminder: We do not allow any patented varieties at out scion exchange events. Some patented varieties of fruit you may recognize are: ‘Zestar’ Apple, ‘Pinova’ Apple, ‘Skeena’ Cherry, ‘Minnie Royal’ Cherry, ‘Royal Lee’ Cherry, ‘Sequoia’ Fig, ‘Jupiter’ Seedless Grape, ‘Neptune’ Seedless Grape, ‘Cotton-N-Candy’ Interspecific, ‘Emarald Beaut’ Plum, ‘UFO’ White Peach, ‘Harrow Sweet’ Pear, ‘Angel Red’ Pomegranate, and about 1,600 more varieties. Luther Burbank died with limited financial benefit from all the varieties he bred because he did not enjoy the protection of plant patents. Though he supported the protections plant patents would provide, it was just a few years after he died did the Federal Plant Variety Patent Legislation get passed into law. “What is a plant patent? 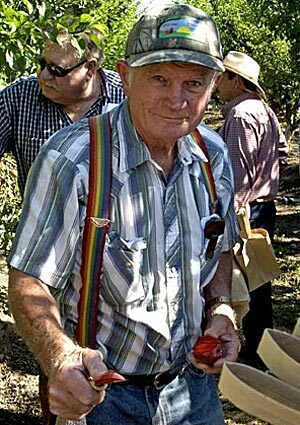 Let’s respect and reward fruit breeders work!. We respect the rights of the breeders who hold these patents. Plant patents do not last forever. They do eventually expire, 20 years from the filing of the patent application. They are then in the public domain, and are free to share. Thanks to the hard work of fruit breeders from Zaiger Genetics, University of Minnesota, Armstrong Nursery, and many, many others; we may consider these great modern varieties ‘future heirloom’ fruits. Trademarked names are a separate issue. Trademarks are brand names used for certain varieties, with the mark ® if federally registered (renewable every 10 years), or with the ™ if the trademarked is just claimed. Collect scions while you prune your fruit trees. 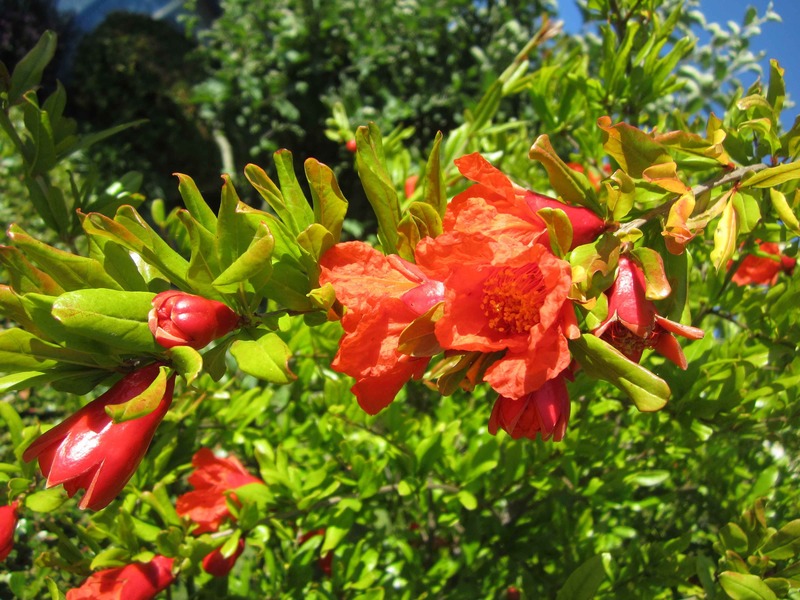 Pruning classes abound in the Bay Area: at Berkely Hort. Nursery, Berkeley Youth Alternatives, the Institute of Urban Homesteading, and other venues. 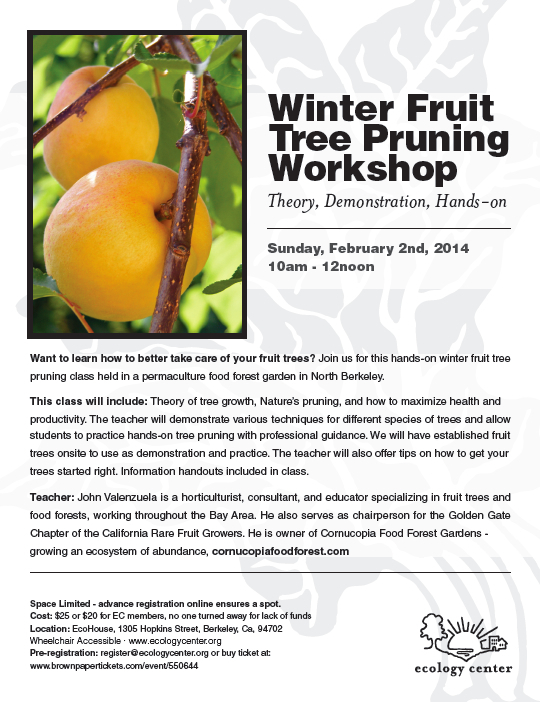 Please let me know if you need advice regarding your fruit trees, or need any pruning or grafting this season. See you at the exchanges! Or maybe at that cherimoya tasting in So Cal. I drove from the 54 degree foggy coast of Santa Cruz to the 93 degree early summer Central Valley heat of Fresno, which can be regularly over 100 degrees later in July and August. 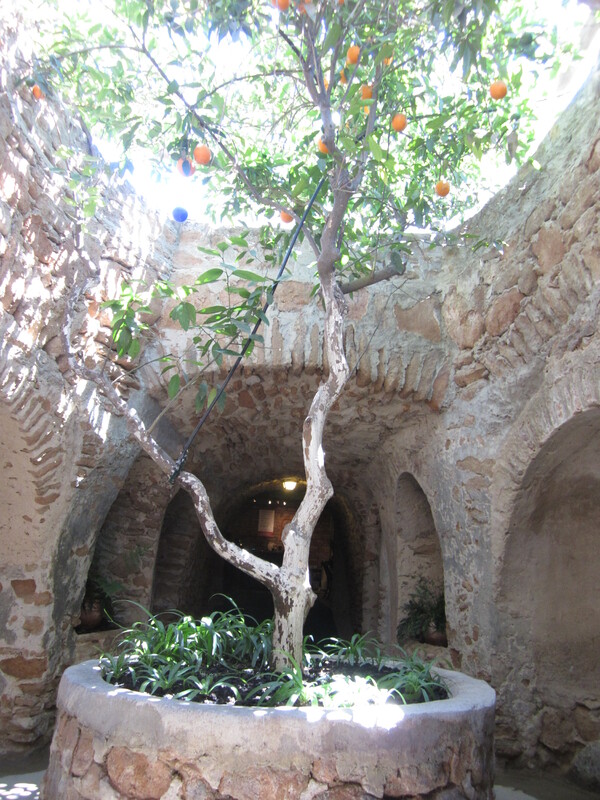 It was this extreme heat that Forestiere sought to escape in his underground caverns, creating an productive oasis of citrus and many other fruit trees that grow throughout his artistic home in a never ending expression of his visions of paradise. Immigrating from Sicily as a 22 year old unschooled and self taught skilled laborer, he left is homeland after a bitter argument with his father to seek opportunities in America to start his own citrus empire. First living in Boston and New York, he labored digging in the new subway tunnels. The unfriendly winter climate frustrated his dream to grow citrus, so he left the North East to search for suitable terrain in the famed subtropical fruitlands of Southern California, only to be thwarted by the exorbitant land prices. He heard rumors of less expensive land to the North, in the Central Valley farming town of Fresno, where he arranged to purchase 80 acres, sight unseen in 1906. To his dismay, he discovered his new property was underlain with a shallow hardpan of cement like sedimentary rock, making planting trees near impossible. In addition the searing summer heat was especially brutal that year. Seeking to escape the heat, he excavated an underground shelter, breaking through the hard pan, and using the rock as bricks. 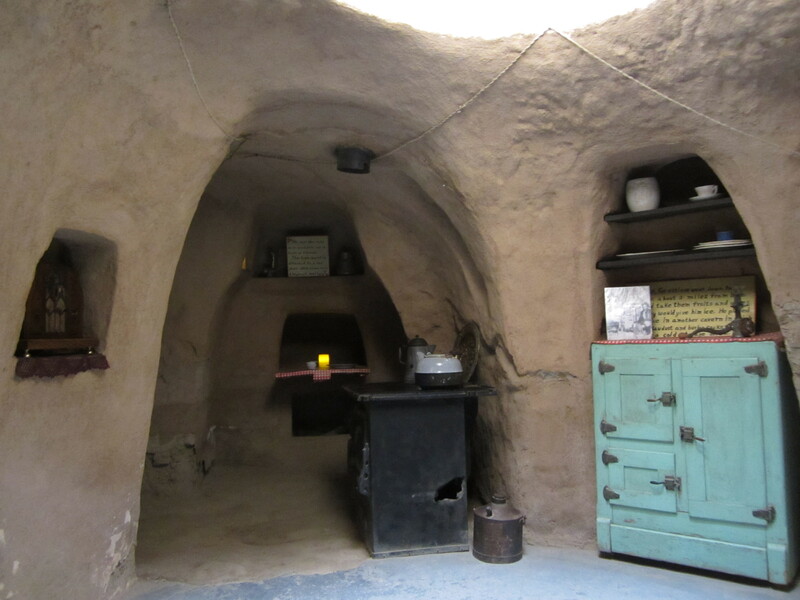 He knew such a shelter would be cool in the summer and warm in the winter, as the earth has an average 55 degree temp year around, at a 20 foot depth. 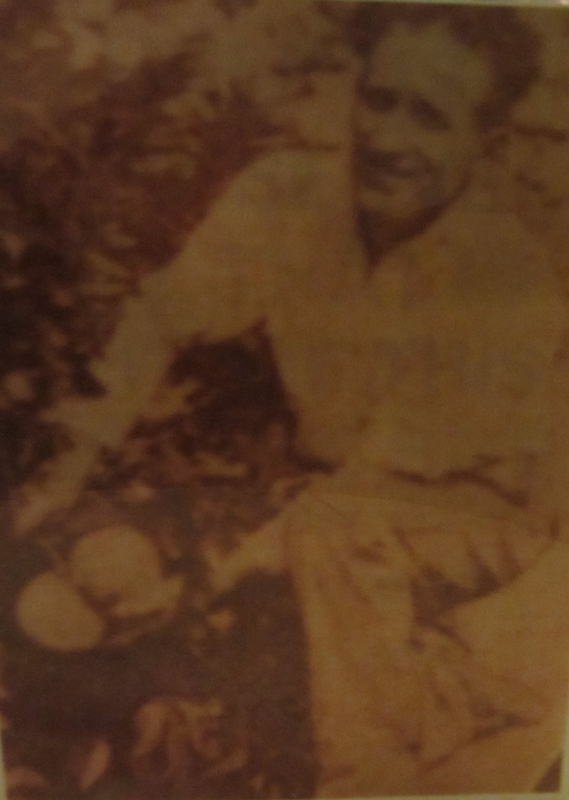 By day, he was employed as a ditch digger in the area, as he developed his property in his ‘spare time’, by himself. 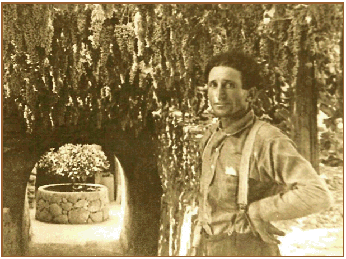 Never using dynamite, as he feared the damage of work already completed, he worked endlessly with only his hand tools, and his two mules, for some 40 years, until his death in 1946. His creation was no dark, dank cave- Throughout the endless maze-like tunnels there are hundreds of wonderful ‘Roman’ stone arches, full of light and cool fresh air, amid an abundance of fruit hanging from the living trees! 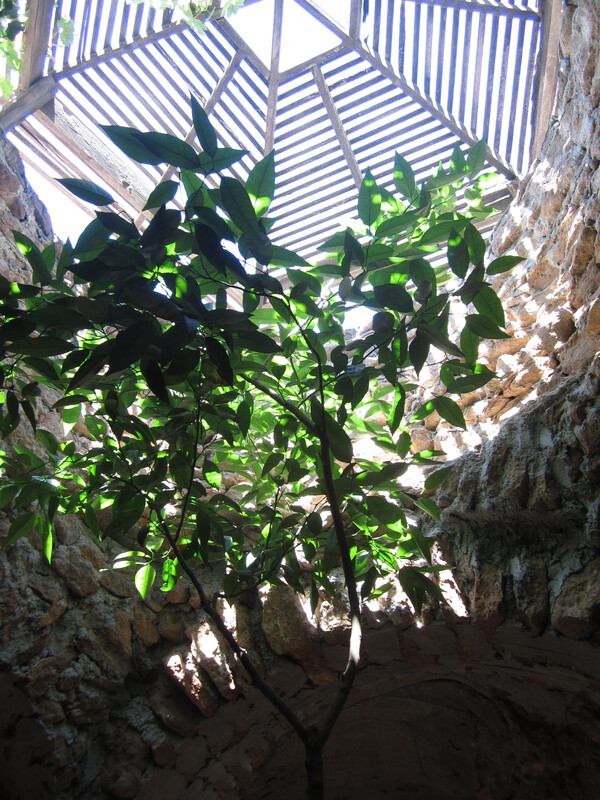 Fulfilling his dream, Forestiere found that he could cultivate his beloved citrus and other fruit trees in rock walled planters under the many skylights, protected from winter frost and summer sun with lath structures, the roots remained cool in the summer and warm in the winter. Inspired by his Roman Catholic faith, he created many plantings with patterns of threes and sevens, representing the Holy Trinity, and the Seven Sacraments. Without any written plans, he worked from his mind’s eye, eventually manifesting some 55 rooms, atriums, and grottos, including a chapel, 2 bed rooms, dining room, kitchen, fish ponds, ball room, extensive car port and more, wandering under more than 10 acres of land. Not only beautifully inspired, it is functional vernacular: with a water well, rain water catchment and drainage systems, solar heated bath, wood heating kept the small rooms cozy and the earth kept it cooled. Hundreds of ‘Roman arches’ support the ceilings, while the natural airflow is directed to keep a cool breeze circulating. 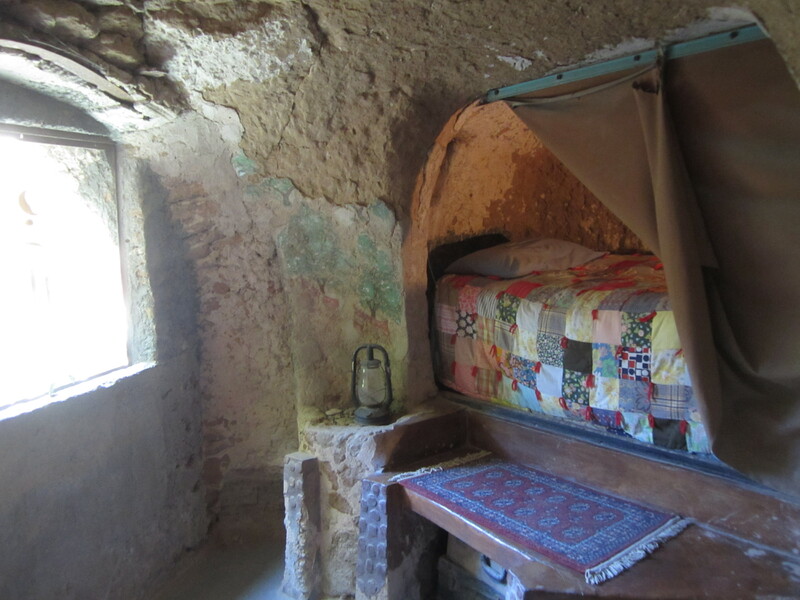 Many passage ways and rooms align to allow views across hundreds of feet underground, while some secret observation holes were used to watch for the possibility of intruders, inspired by the famed secret catacombs of the old country. After completing an adequate home for himself, he continued with his labors, with his ultimate plan to create an underground oasis resort for visitors to escape the summer heat, and to share in the enjoyment of the abundant fruits of his gardens. He never opened the resort, having worked for some 40 years on his ever expanding visions, is was never quite ready for the public. 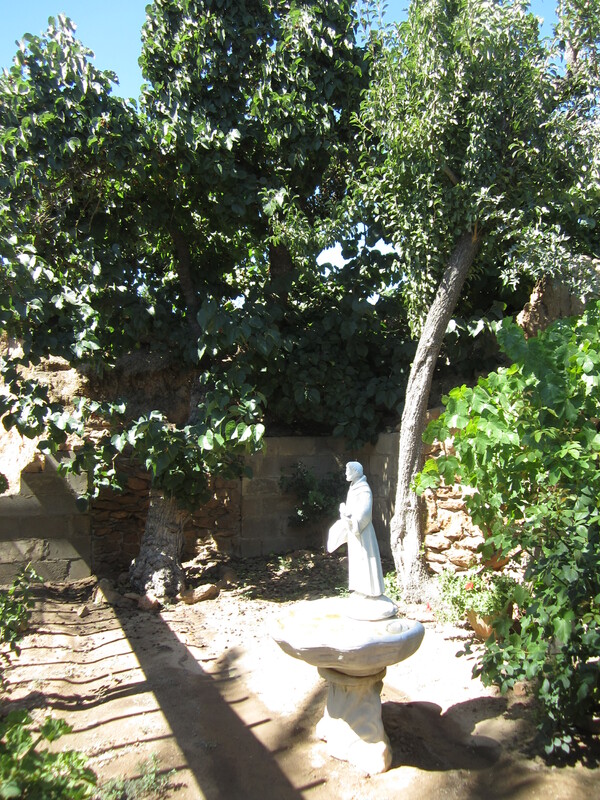 Though needing constant care and maintenance, the stonework stands strong, and the fruit gardens live on, including many species of fruit trees, now still bearing, after more than 100 years . 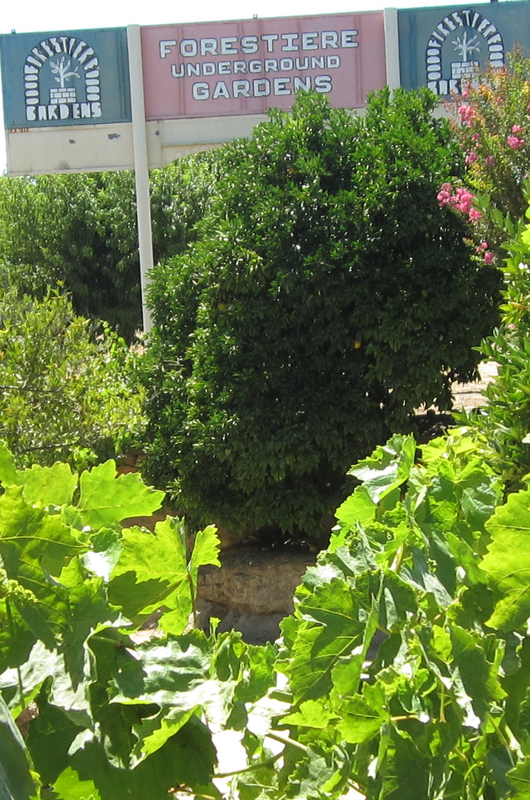 ‘Muscat’, ‘Grenache’, ‘Black Morocco’, and ‘Zinfandel’. Another unique skill applied to his vision was the many multigrafted citrus trees, still found found flourishing and full of fruit today. You can learn how to graft citrus too! I have done several grafts onto one citrus tree, but Mr Joe Real of Sacramento, has a tree of more than 100 varieties on one tree! Yes, that would be lot to manage, but it is possible. If you are at a more ‘beginner’ level of wanting to learn how to graft a single variety, trying your hand at this ancient art of ‘making two grow as one’, please join us this weekend. 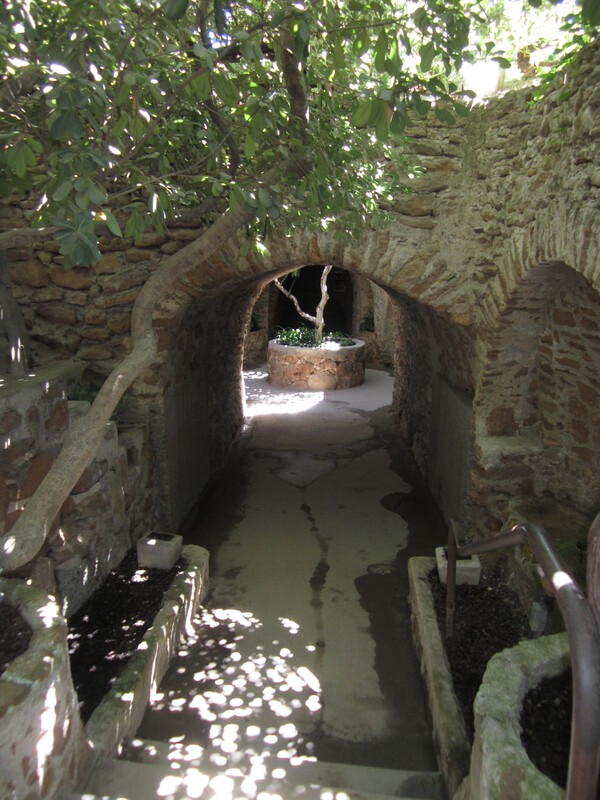 This summer, when Fresno is sweltering in typical 100 degree plus heat, take the time to retreat into the lush and productive subterranean oasis that is the Forestiere Underground Gardens. A truly unique and inspirational food forest! Whether you visit to take a tour or not, please let them know you are opposed to any disturbance to the gardens and access to their educational tours during the proposed high-speed rail development construction adjacent to the gardens. In my last post, I mistakenly announced the Final Farm Fiesta was on Saturday, but it was held on Sunday. Hayes Valley Farm was from the beginning planned as an interim use of abandoned freeway off-ramp land that eventually would be built upon when the economy picked up. For three years the farm has grown literally tons of food, through touching and been touched by thousands of urban SF gardeners. Inspiring!